Hello Aspirants, as we all know that the KV Sangathan invites the 592 Application form for the posts of PGT. out of this, the KVS invites the 50 application for the post of PGT Biology. 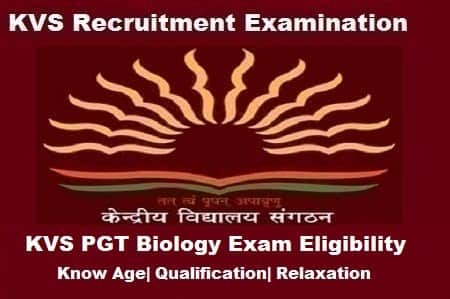 Every Candidate who are going to apply for the post of KVS PGT 2018 Exam they definitely want to know about the KVS PGT Biology Eligibility Criteria and KVS PGT Biology Age Limit. So Through this article, we will help you to know about the Complete Eligibility Criteria which is required for KVS recruitment Exam 2018. The Teachers are responsible for the perfect teaching and delivery of all subject, with the particular emphasis on the core subjects Like Literacy, numeracy, and science. Before we speak about the eligibility criteria for KVS PGT Biology Now let’s have a brief look at the vacancy available for KVS Exam 2018. Two Years Integrated Post Graduate M.Sc Course of Regional College of Education of NCERT in the Subject Concerned. Master’s Degree from a recognized university with at least 50% marks in aggregate in Biology subjects.